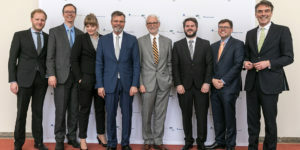 At the occasion of the Transatlantic Digital Agenda Workshop in Brussels, The Aspen Institute Germany, the Internet Economy Foundation and the Atlantic Council had the distinct opportunity to host a high level dinner on the topic: The EU’s Role in Creating a Fair, Competitive Digital Market. 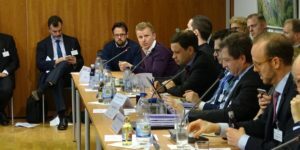 The Aspen Institute Germany, the Atlantic Council, and the Internet Economy Foundation organized the first Brussels workshop of their project on the Transatlantic Digital Agenda, at the Baden-Württemberg Representation on September 26 and 27, 2017. The common set of values between Europe and the United States from the basis of our contrat social that guarantees our citizens freedom, equality, democracy, openness, and the rule of law expressed in the U.S. Bill of RIghts and the French Declaration of Human Rights in 1789. 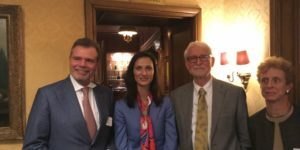 In the UN, Bretton Woods institutions, Geneva Convention and NATO, Europe and the U.S. forged an international system based on the shared values. Now these Values must be adapted to the digital age – a sort of contrat social digital.